Grass Creek is a tributary of Irondequoit Creek, located in the Brighton-Browncroft neighborhood of the Town of Brighton. The small creek flows northeast, emptying into Irondequoit Creek in Lucien Morin Park. As the creek approaches Browncroft Boulevard/County Route 286, the creek enters an open concrete spillway, approximately 7' wide. The creek is entirely in the right of way of the road. The spillway features two rebar ladders to access the creek bed from the road. Sloping, slick, and covered in algae, the spillway is a potentially dangerous path to traverse. 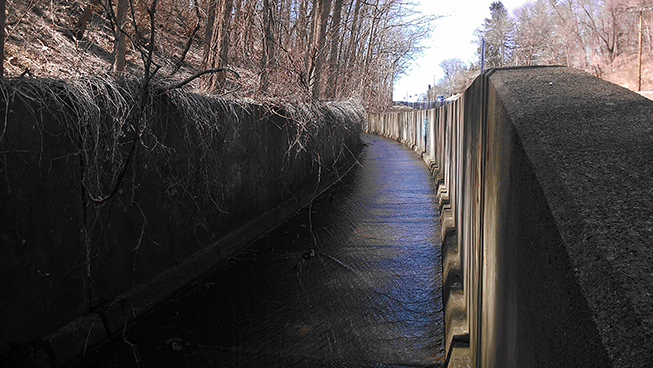 Moving downhill and through two tunnels, Grass Creek eventually empties into Irondequoit Creek in Lucien Morin Park.